Damien Filer is a freelance writer from Eugene, Oregon. His recent publications include stories in VB Tech Journal and in the anthology Buried Treasures. He has sold fiction to a broad range of publications, from Pulphouse to Penthouse Special Publications to the anthology 365 Scary Stories. Dark Planet is designed and edited by Lucy A. Snyder. If you spot any errors, or if you have any comments, please contact her at lusnyde@indiana.edu. All materials copyright 1996-1997 by their respective creators. No stories, articles, poems or images from this webzine may be posted or published without the written consent of their creators. HarperPrism. $22.00 hc. 293 pages. The sandman has been present for a very long time in folklore and fairy tales as the man who puts sand in the eyes of children to make them sleep. DC Comics unveiled a sandman (millionaire Wesley Dodds) replete with fedora, cape and gas mask in WWII; then Karen Berger brought in Neil Gaiman in 1987 to revise and revitalize "The Sandman" to what we all know him to be today. In seven years The Sandman sold over 12 million copies for DC Comics and was the winner of the first World Fantasy Award ever given to a comic for "A Midsummer Night's Dream." The Sandman has been called "The comic for people who don't read comics." While in Japan comics (Manga) are amongst the most distributed of publications, read by a broad cross section of the population, this has never been the case in the United States. Neil Gaiman's Sandman, however, has pioneered a renaissance of the form with readers ranging from Harlan Ellison to Truman Capote, from Stephen King to Norman Mailer and Samuel R. Delany who wrote the introduction for A Game of You. Karen Berger says that Sandman is probably read by more women than any other mainstream comic. The Sandman is the story of a God confronted with his own mortality. It all starts with a magician named Roderick Burgess, founder of The Order of Ancient Mysteries, based in "Fawney Rig," a Sussex Manor House. Attempting to trap the (as Karen Berger describes her) "adorable and ultimately pragmatic" Death, he catches instead her younger brother, and closest sibling, Dream. After 75 years, Dream (also known as Morpheus, or the Shaper) finally escapes but finds his realm, the Dreaming, in ruin. The Sandman is a family saga, chronicling Dream and (described by Karen Berger as) "his dysfunctional and pantheonic family the Endless," including siblings: Death, Desire, Despair, Delirium (who used to be called Delight), Destruction and Destiny. "The Sandman" will never be the same. For followers of The Sandman, Neil Gaiman having co-edited this collection serves as a kind of security net, an insurance policy, on the stories chosen; for who knows better what truly represents the vision of The Sandman, and perhaps even a broadening of that vision, than the creator himself? Further, The Sandman is an ideal theme for an anthology because it necessitates much less falsity and superficial imposition into storylines than other, more specific themes. There is, I should point out, one down note for those exploring the dust jacket who are led (understandably, as I was), to believe that they will be treated to a new piece of fiction by all who are listed there. Instead, there is only a frontispiece entitled "Death" by Clive Barker, a sestina by Lawrence Schimel, and finally, a brief afterword, also entitled "Death," by Tori Amos. There is no fiction by Frank McConnell either, but his preface is, nevertheless, one of the strongest pieces in the book. After I read it I knew for sure that I had in my hands a book I would long remember. In just a few short pages McConnell addresses the duality of sleep and waking, of storytelling and religion, the invention of God(s) -- in short, the history of The Sandman, right back to DC's original WWII "golden age" comic, and how Neil Gaiman got involved with, and changed The Sandman forever. The first story, Colin Greenland's "Masquerade and High Water" instantly, effortlessly and fluidly whisked me past any trepidation about the collection and set me sailing on a flowing river of words, subtly reminding me of the reason I read in the first place. His is a lavish, and yet subtle love story. There are characters so real you will surely think you know them, and characters so fantastic you will only wish you did. His images cover broad canvases with poetically economical strokes. It is the kind of writing that makes another writer envious, first evoking a sense of futility in pursuing the act, and finally leaving them inspired and full of fever for the hunt. John M. Ford's "Chain Home, Low" (which refers to a British air-defense radar to detect inland and low flying German planes during the second World War) is set in the first Sandman episode, "Sleep of the Just." The writing is omniscient, yet precise in its description of historical settings and events as well as the only peripherally present, Dream. The mood of The Sandman underlies everything while the story itself is constantly averting your eyes from what lies beneath. The story is scattered throughout with dry wit and cryptic but exceedingly well rendered characterization. He creates the mirage of a novel's depth in a short story. "Chain Home, Low" is a morality play, a dark story about hope set against a variety of backdrops from a castle to a mental hospital to a war. At the end of the story one character notes: "The Lord does not jest; but I wish I better took his meaning." It made me think and I can ask no more of a story. "The Writer's Child" by Tad Williams fulfills every desire a reader can have for the elements of a classical story, and yet is told in a way unlike any story you've read before. There are two points of view. The first is young Jessica who tells a story about a Glass Castle and its inhabitants: Princess Jessica, The Queen of Flowers and the King of Glass. The other point of view is derived from a manuscript written by the King of Glass (which Jessica, who insists she is not the Jessica the story she has written is about, finds in the garbage) and which tells its own fantastical story. The King of Glass describes how he sees the writer as being in the masculine role, planting the seed, and the reader in the feminine role, harvesting the crop, and how together they create the writer's child. Though we never leave either of these fantasy worlds we leave the story with a very definite and unforgettable picture of why Jessica is so unhappy in the Glass Castle. This question of the two imaginations that merge to create a story becomes particularly interesting when considered in the context of entering the world of The Sandman for the first time without art. The contrast of reading these stories with only the assorted authors' prompts and one's own imagination to paint the tapestries of The Sandman's domain is a very different, and uniquely satisfying experience compared with the original comics which were, or course, illustrated, each by a different artist. 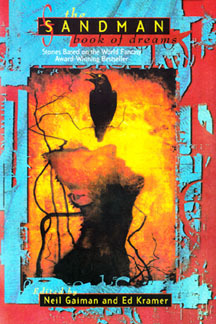 The haunting jacket design, however, is by Dave McKean who will be familiar to readers of the original Sandman comics. Will Shetterly's "Splatter" is set during Sandman # 14 (called "Collectors" in The Doll's House collection) and it is another writer story. As is pointed out in the introduction to the story, for anyone who has ever been to a signing or convention Shetterly nails the setting and characters that inhabit them. The story is very readable, filled with dry, sometimes flat and often black humor about the way the world looks to a writer. Unfortunately, for the writer, the world begins looking a little too much like the world Stephen King's Paul Sheldon found himself trapped in when he met his number one fan, Annie Wilkes, in Misery. "Splatter" ends up being too predictable too soon, however, (or so we are at first led to believe.) It offers moments of great insight, such as a look at the promises the world makes to us all, and the lifeline a television set can be when we're otherwise cut off from the rest of the world. Perhaps the strongest single line in the story deals with the recommitment a man would make to his family if he escapes the danger he's presently in. "When this was over, he would go home, and though he would never tell anyone what had happened this weekend, he would tell Jan that he would do anything for her and the girls, even if that meant learning how he had failed them." I would like to have seen the story lean more to the serious than the satirical. The ending, however, does provide an unexpected and unique, if open-ended, twist. The year is 1108. Lisa Goldstein's "Stronger Than Desire" opens when a young lord named Raimon is separated from his hunting party in pursuit of a deer. He ends up letting the deer escape when he comes across the most beautiful woman he has ever seen. Desire calls herself Alais and it is much to the chagrin of the lord's men that this woman of questionable lineage and no intent to marry should return to the lord's castle, and his bed. Raimon ends up making a wager with Desire. He must pick two people whom Desire cannot pair. Only if he succeeds will Desire marry him. Goldstein's story explores what one thing in the scope of human emotion could be stronger than desire. In "Each Damp Thing" Barbara Hambly ventures into the Dreaming. Eve's oldest son, Cain, still harbors resentment toward his stuttering younger brother, Abel, and his mother, Eve. "That's me, yer worship," (Cain says in 'Imperfect Hosts,' the second story in the Preludes and Nocturnes collection), "Purveyor of penny dreadfuls, shilling shockers, blood and thunders and fust-rate nightmares." His quest for some edge, some foothold in the world leads him into the ruins of the palace of the Dreaming where he steals a mirror. Hambly's story becomes something of a black comedy as Cain ambles back through the palace of the Dream King with the recently re-murdered Abel in a wheelbarrow, along with the baby gargoyle, Goldie. Also in the wheelbarrow is the mirror which is the story's centerpiece. Abel pleaded with his brother to take the mirror back from the time Cain had stolen it, and finally he does. What they find upon their return is a palace filled with frights and nightmares. "Each Damp Thing" is a parable about the ironies of blind, and brotherly love. Hambly's often invisible prose shine periodically throughout with turns of phrase like time release capsules that will make you stop a paragraph later to go back and read them again. George Alec Effinger's "Seven Nights in Slumberland" comes alive with rich, animated settings and, at first, awkward dialog that quickly grows on you. It is 1905. His six-year-old protagonist, Nemo, takes seven eventful trips to Slumberland. The first night he takes in a Giants vs. Pirates baseball game at Slumberland Stadium. Soon, though, he meets up with the Spirit of Heart's Desire who sends him on a quest to find her golden bottle filled with dream dust. On his journeys he reads from the book of all that is known. At first he is perplexed by the logic of the chapter describing how the world was made being a quarter of the way into the book. However, he soon realizes that if the book truly contains everything that ever happened, and everything that will ever happen, then surely it can tell him if he will ever find the golden bottle. And so his adventure continues. Robert Rodi offers "An Extra Smidgen of Eternity." Wanda comes in to relieve Ray's watch over their dying friend Darren in the hospital. Once Ray leaves Wanda proceeds to tell the unconscious Darren a story about one Countess Protopsilka. There is a jarring, though interesting, point of view shift as we go into Darren's head when a nurse comes in and tells Wanda he probably can't hear her anyway. It is an understandably strange place to be, inside the head of this dying man, but it is the wellspring of many interesting ideas. First of all, Darren finds the reaper, when she comes, to be an altogether likable sort. When she tells him it's time to go, he explains that he desperately needs to hear the end of the story, and of how important he considers stories, describing them as spiritual currency. You'll have to read the story yourself to find out just how the reaper goes about granting his wish. "The Mender of Broken Dreams" by Nancy A. Collins takes place in the Restoration Department where broken dreams are repaired, or at the least, retooled. The tools of the Mender's trade include everything from a jeweler's eyepiece to a potting wheel to an electron microscope. The story opens with wonderful writing and imagery but really picks up when the Mender begins to question his own identity. The quest leads the Mender to Morpheus himself, who is so impressed with the Mender's work he grants the request. Morpheus shows the Mender what he wants to see, though he questions whether the Mender will really want to see it in the end. What Morpheus shows him is something which can never be mended. Other stories include: Caitlin R. Kiernan's "Escape Artist" which deal's with A Game of You, the fourth Sandman story arc. The writing is poetic. It sweeps you up into a trance and then can startle with its selective bluntness. B.W. Clough's "The Birth Day" is the story of a meeting on the banks of the Euphrates, what Ikat, the story's protagonist, learns from the Shaper and what the Shaper learns from her. Karen Haber's "A Bone Dry Place" is a story about a crisis line, crossed connections and Armageddon. Delia Sherman's "The Witch's Heart" is filled with blood, love, wolves, desire, and, of course, a witch's heart--literally. Steven Brust, who himself has appeared in such Sandman locales as The Worlds' End pub in the Worlds' End collection and the Renaissance Festival in the story "Sunday Mourning" from The Wake provides a "folk tale." Gene Wolfe's "Ain't You 'Most Done" is about a man who has never dreamed. The story is filled with nineteenth-century sea songs and other folk music. Finally, the last story in the collection, "Stopp't-Clock Yard" is "about the Returns." This book is for adults, but it is for adults precisely because of the child-like sense of wonder it instantly evokes, a sense of wonder only an adult can recognize and appreciate. The Sandman: Book of Dreams was delivered to me, out of the blue via UPS. When I opened up the package I felt like a kid again, unwrapping that mail-order glow in the dark inflatable Frankenstein from the back cover of a comic book. The only difference being that with this book, once I opened it and delved into the mysteries it beheld that sense of wonder was not only sustained, but magnified. When discussing this book, and the feats attained by those who contributed to it, it must go without saying, that all of the inspiration for the ink spilled in compiling this collection was first conceived by the vision of the world's creator, Neil Gaiman, who turns the notion of dreams and waking in fiction from cliches that cause editors to cringe, into, as Titania, Queen of Faerie (from Neil Gaiman's graphic novel The Books of Magic) would say, "all that matters. Do you understand?"